2 bedrooms, 1 bathroom, living room, kitchen/dining, patio. MW, DW, W/D, Cable TV, WiFi/DSL. POOL PRIVILEGES @ DAYS INN. BEDS: 1 Queen, 2 Double. Accommodates 6. NO PETS, NO SMOKING. needed a last minute mini vacation. This place was available and had good reviews so we booked it. Wasnt to sure how it would look from the photos, but was pleasantly surprised. 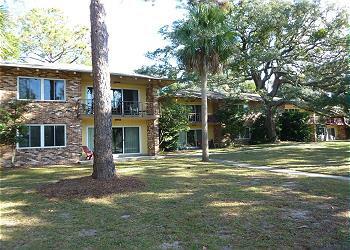 Easy check in, well maintained and the condo was exceptional clean. (fyi i own a maid serrvice) We cooked 2 meals a day and had everything we needed. We also enjoyed the beach house restraunt close enough to ride bikes to. We rode bikes, went to the pier, went horseback riding, and of course went to the beach. Driftwood beach is beautiful. We will be back again. The rental is the best location on the island. The accommodations were great. The rental had everything I needed for my stay. The unit could use a fresh coat of paint inside. But I would stay here again. Only negative is beds and carpet need to be replaced in the bedrooms. We had stayed here previously several years ago (4 yr lapse)and the furnishings were awful and kitchen appliances horrible.. I am pleased to report that everything has been updated and upgraded. You cannot go wrong staying here. Will definitely be back and recommend to everyone. Our apartment was clean and well maintained. The A/C worked great. It was foot steps to the beach and very quiet each night. We even had daily visitors from local deer. Enjoyed it tremendously. I have been staying in these same properties for yrs and love them! I love the $, the location, everything about them! We had the best time staying at Atlantic Breeze. It was very clean and the staff was very helpful. I will be using them again.